Industrial investment in IoT is first and foremost about creating value. Whatever your specific scenarios may be, opportunities begin with the ability to know the state of your machines and the world around them at each moment in time. This data becomes fuel for predictive maintenance, yield optimization and new revenue streams. Raw data must be collected, cleansed and transformed into forms the engines of enterprise can put into action. Cars don’t run on pools of petroleum buried miles underground. Drilling, pumping and refinement turns sludge into speed. Similarly, data collected from “things” must be normalized, contextualized and integrated with enterprise ERP, CRM, BI and other systems to create value. IoT systems face the challenge of the 3 V’s — velocity, variety and volume. Errors range from the obviously corrupted to the well-formed but highly inaccurate. Unauthorized data and commands from malicious actors create additional risks to the system. How will you track data provenance and verify a chain of custody for all events? Can you ensure only trusted events are pulled into your enterprise systems, machine learning, analytics and other tools? How are you keeping dirty data from polluting your enterprise? These challenges must be addressed upfront for real learning to occur. As systems collect and process data, organizations must also operationalize what they discover. Each consecutive insight should fuel the next in continuous learning loops. Adaptable data management services can ensure a reliable supply of clean, trusted data for building and training predictive models, turning these derived insights directly into improved system performance. Such systems turn incoming data into consistent, immutable and normalized records for your machine learning, analytics tools, and for data scientists to process and then deliver intelligent, operationalized insights to your enterprise integrations and IoT applications. 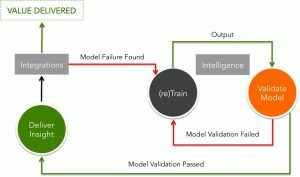 This method of data management enables your intelligence tools and teams to train and validate models for machine learning. When outputs of real-world integrated systems don’t match the predicted model, failure data is cycled back into the model retraining and validation process. With IoT learning loops and predictive models, you can replace “scheduled maintenance” with “likelihood of impending failure,” thereby eliminating unnecessary visits and emergency repair calls. As equipment uptime and customer satisfaction increase, new sales tend to follow a similar growth pattern. Thus, adoption of IoT and automated monitoring of machines does not remove the need for human technicians. While it does mean the number of technicians needed per machine decreases, IoT enables organizations to increase the number of machines in the field along with their overall revenue potential. Will the IoT technology you invest in today deliver value over time as the world changes around you? That depends on whether your team assembles an application conforming strictly to the current model, or adopts a flexible interface atop adaptable data management services not bound to specific machines, data types or processing tools. Artificial intelligence and machine learning processes are improving at fantastic rates, faster than your internal systems and teams will be able to keep up with. Your chosen architecture should provide a stable interface for your business and data layer while enabling your organization to reap the benefits from improvements in IoT analytics and infrastructure. To realize significant value over time, your organization’s IoT offering should be designed to learn and evolve, enabling your team to quickly adapt to new business opportunities and take advantage of higher performing technologies without requiring costly architectural updates. Been using Lync Online for a few months with just over 100 users. If you don't need the voice it's great. If you expect it to replace your "phone" conference bridge...it will not... you still need that BT conferencing phone number as Lync Online can't do that... On site can. The biggest PITA that was just glossed over above, is ADFS 2.0. You will need at least 2-4 servers internal and in your DMZ to allow MS Online to authenticate your users to a common domain. There will be clean up tasks with your AD... you'll be deep into powershell commands to get the ADFS 2.0 service working with MS Online. You will ask... if I had to setup 4 servers, load balancing, ect at MY site...why am I using this hosted service anyway? I might as well just host the whole thing in my own datacenter. Otherwise.... it works and I don't have to apply the updates to Lync Server 2010.